In 1967, New Musical Express ran an advert seeking composers/artists to form new musical groups. One who answered the article was 20 year old musician Elton John (then known as Reg Dwight) who wrote only music. Another was 17 year old poet Bernie Taupin who wrote only lyrics. The two were paired together, and in hindsight, it can be summed up as nothing other than divine intervention. Assigned with producer Steve Brown, the duo churned out tunes that they thought sounded acceptable to the radio masses. After listening to a rough demo, Brown encouraged them to forget about formula and write what they wanted to write, what materialized was Empty Sky. As one might expect, the release was very experimental, the key players still sniffing each other out, trying to make success but not be pretentious. The result, while pale with later releases, is an excellent freshman effort. We are treated to many different styles of music. The title cut that leads the record is reminiscent of The Rolling Stones while Vahalla clearly has Procal Harem influences. The lyrics are a little "hippie" which would be Taupin's trait for the next few years. He now admits he thought it was "cool" when lyrics didn't make sense. This is most obvious on Hymn 2000 and The Scaffold. The album's best track is undoubtedly Skyline Pigeon which was re-recorded several times during Elton's career. I think this original is the best. It's a rather hollow sounding piece with only a Harpsichord on one channel and Elton's voice on the other channel for the first half of the song. The low point is the last song Hay Chewed which is nothing more than a montage of every song on the release. In retrospect, it's sad how much the music industry has changed in 30 plus years, since a scenario as the making of this disc would probably never be repeated today. 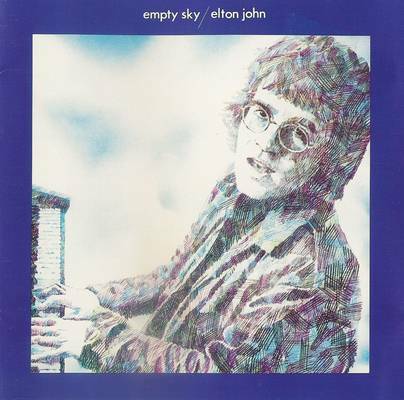 Empty Sky was not released in the U.S. until 1975 when Elton was on top of the world. Serious fans of Elton's work can surely find a few things to like on this effort.